As I mentioned in my previous post, the friend who taught me how to knit (over 10 years ago!) recently had a little baby boy. I knew that I had to make something really special for this little guy, and since I happen to know that his mother loves colors I wanted something really bright! 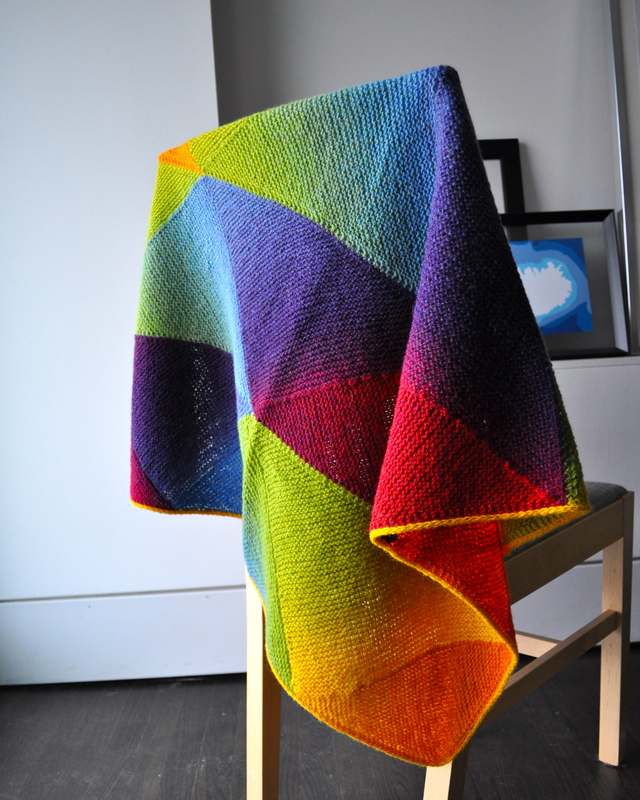 After seeing this project on Ravelry, I couldn’t get it out of my head. 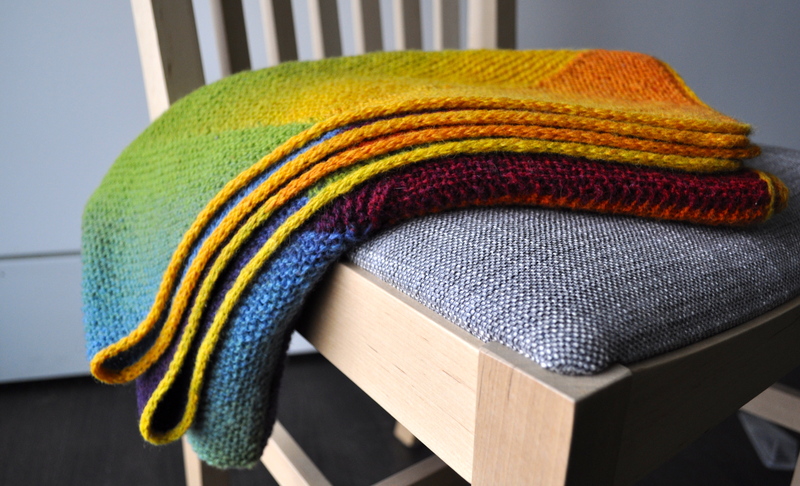 The original project was basically created by stitching together five short Multidirectional Diagonal Scarves. I did pretty much the same thing, except that I joined the “scarves” while I was knitting. When I got to the edge where I wanted to join together two of the strips, I would knit until 1 stitch from the end, slip the last stitch, knit into the edge of the other strip, then pass the slipped stitch over. This created a nice join between the two pieces. When I was finished, I knitted an attached i-cord edging in the bright yellow color, which sort of ended up as my favorite part! 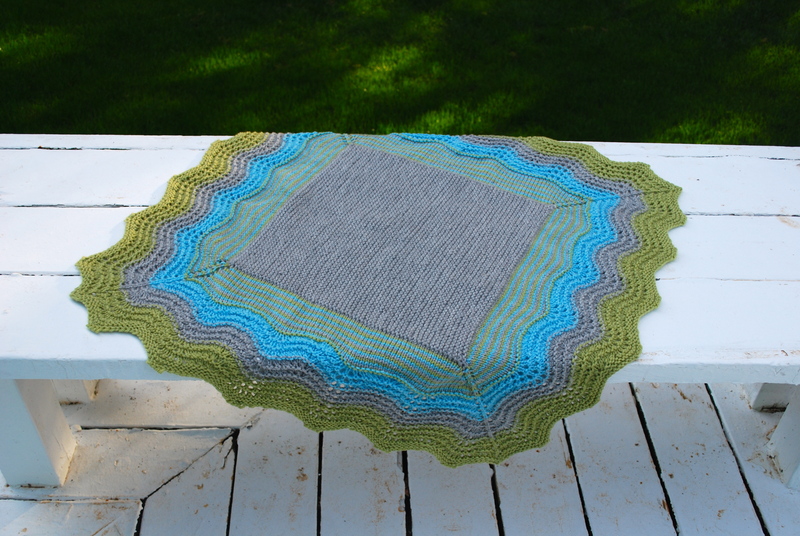 I chose Kauni Effektgarn because I loved the colors in the original project. 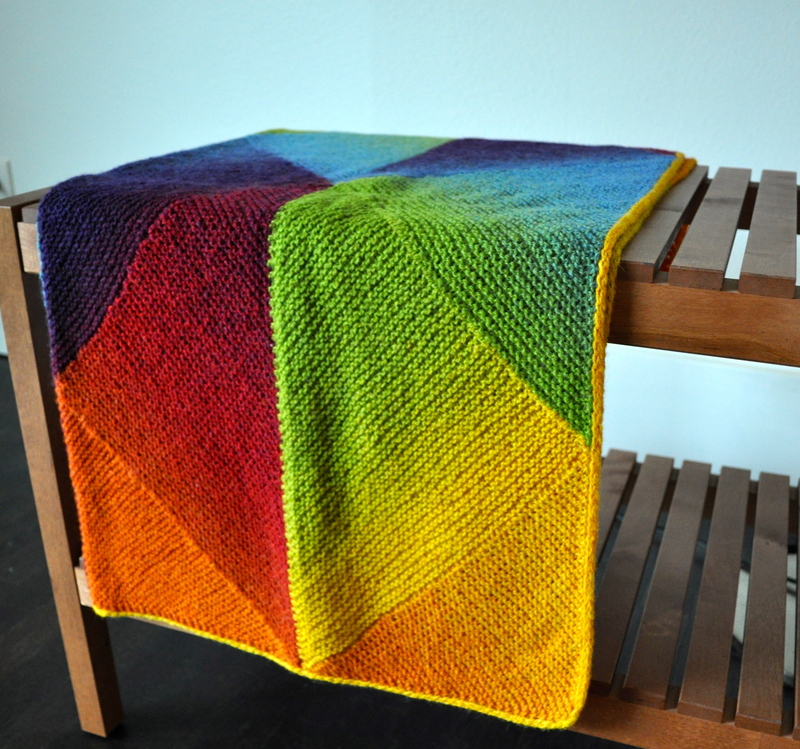 I ended up using the EQ and W-EQ color ways (very similar rainbows, but slightly different – I just mixed up the strips and liked the additional color variation). I only needed two skeins of the yarn! 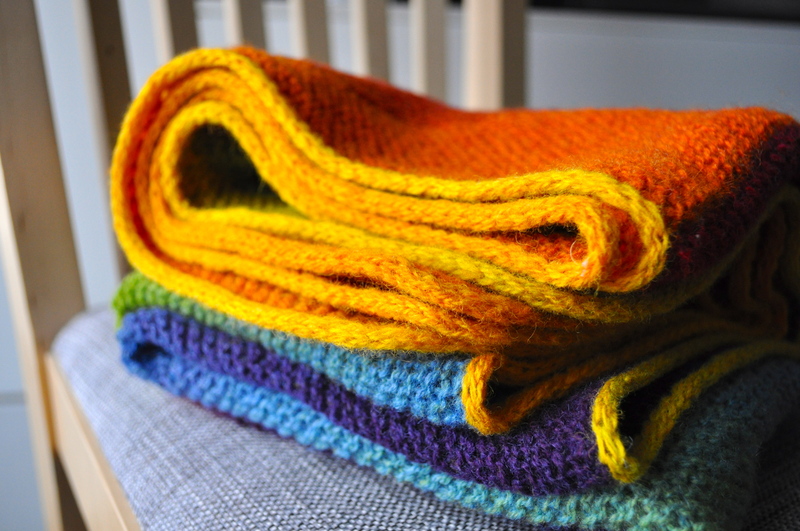 The blanket ended up measuring about 35 x 36 inches with four strips. For each strip, I increased as described in the pattern up to 60 stitches. 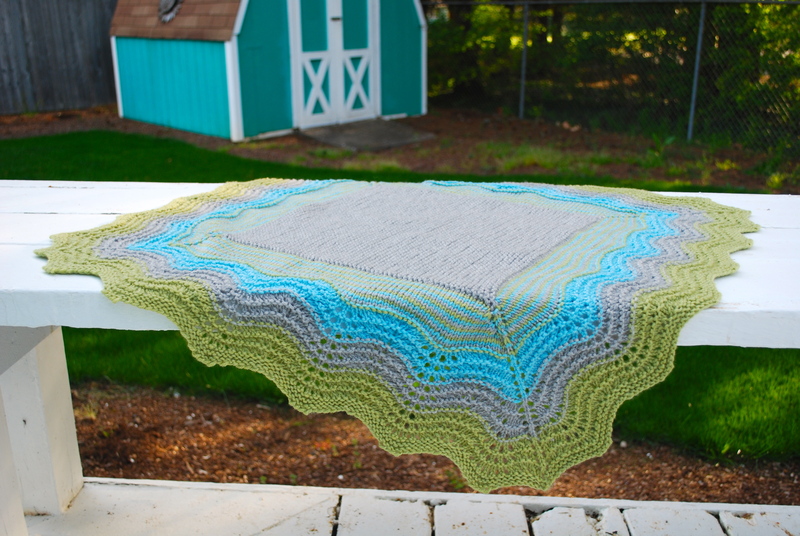 I can hear people out there thinking why would you make a baby blanket out of Kauni and I get it – it was a bit scratchy. It softened up some after a soak in wool wash, but was still a little bit rough, so I sent along a couple of soft receiving blankets to be used with the blankie. 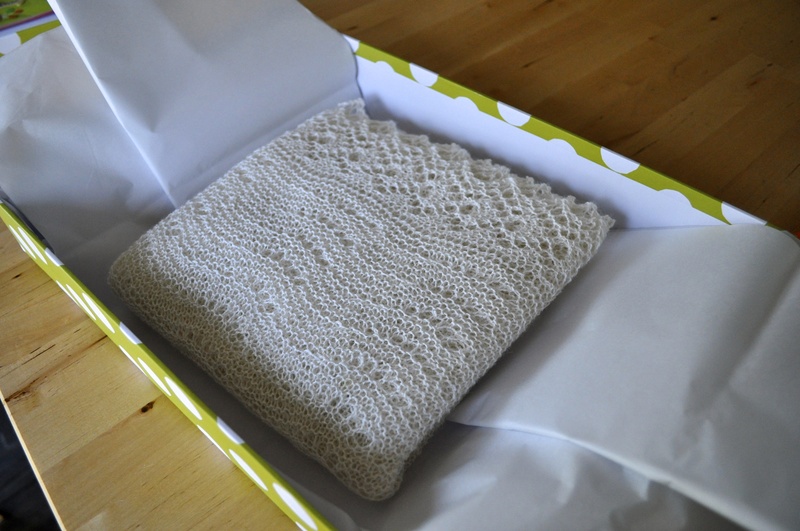 Receiving blanket on the inside for softness, wooly blanket on the outside for warmth! I hope this little baby boy loves it! 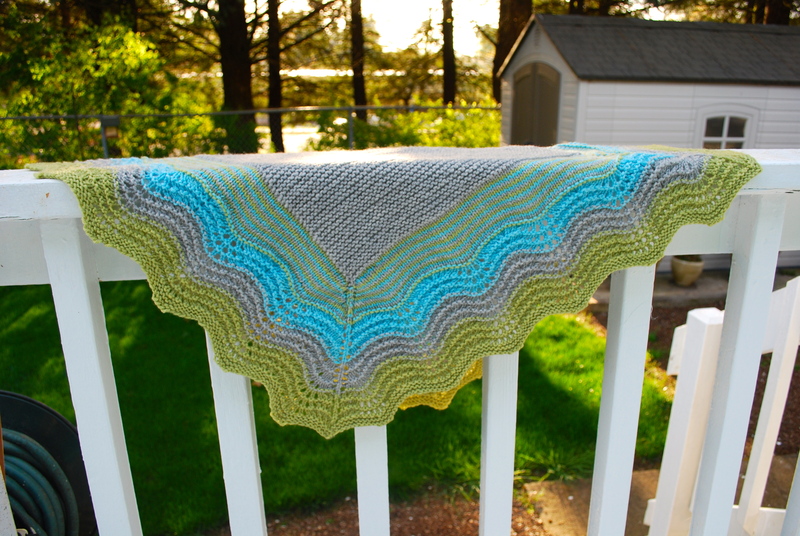 When my friends and I found out that the friend who taught us all to knit – our knitting group matriarch – was about to have a baby, we almost immediately decided that we should knit something together that we could all work on. We settled in to find the perfect pattern but started to worry about differences in gauges and how to make such a modular piece look nice and well planned out. Then somewhere in the back of my head a memory surfaced of the yarnharlot leading a group effort to make a baby blanket at one of her retreats, where many retreaters participated. I figured many knitters equaled even more gauges to deal with than we needed to (with just three of us) and her blanket turned out to be quite lovely. So we settled on trying to emulate that blanket and moved on to choosing yarn colors. We decided to use knit picks swish worsted in Dove Heather (3 skeins), Green Tea Heather (2 skeins) and Wonderland Heather (2 skeins). I know I’ve said it before, but I love this yarn for baby blankets because it’s super soft and machine washable! When it came to knitting the blanket, I knitted the central grey square (starting with a provisional cast on), then picked up stitches to set up the striped section. The three of us then knit the stripes together (like this, except with three people), each of us with our own color (although I can’t quite remember which one I had – I think grey again? 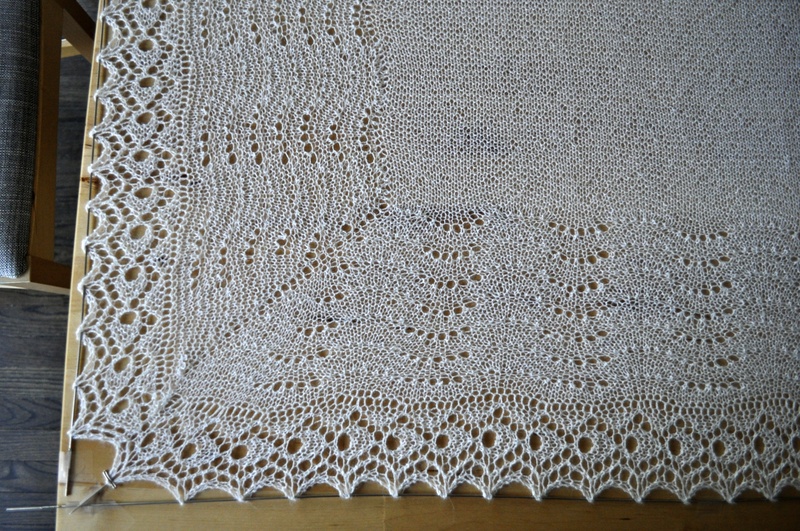 ), and then the blanket was finished with the old shale lace knitted by E. After blocking, she shipped it off and it’s been warming a new little baby ever since! Thanks for the pictures, E! One of my best friends from high school is having a baby in about a month. They are not finding out if it’s a boy or a girl until the big day, so I was a little bit unsure about what to knit! While there are a lot of great gender-neutral patterns out there, I tend to like baby sweaters that fall in the “super-girly” or “little-man” camps. Once the wee one is here, I may make him or her a little outfit, but before that I wanted to get something ready for my friend’s shower. Then it occurred to me that my friend has always had a love for the traditional. 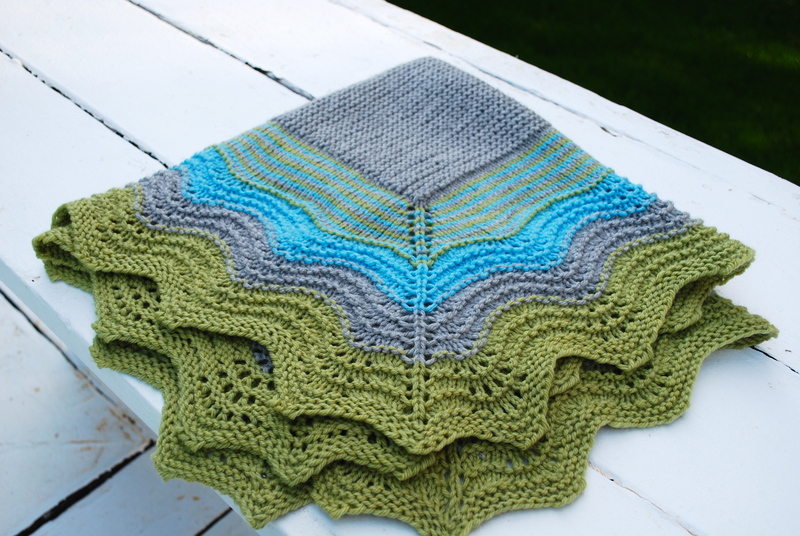 I started thinking that maybe I wanted to knit a beautiful heirloom baby blanket – one that could wrap up all of her future children as well – in a traditional pattern and in a beautiful natural colored yarn. Admittedly, this realization was probably brought on by the fact that I was knitting a Quill shawl (by Jared Flood of Brooklyntweed) for myself out of a gorgeous gray yarn (almost done, pictures soon! 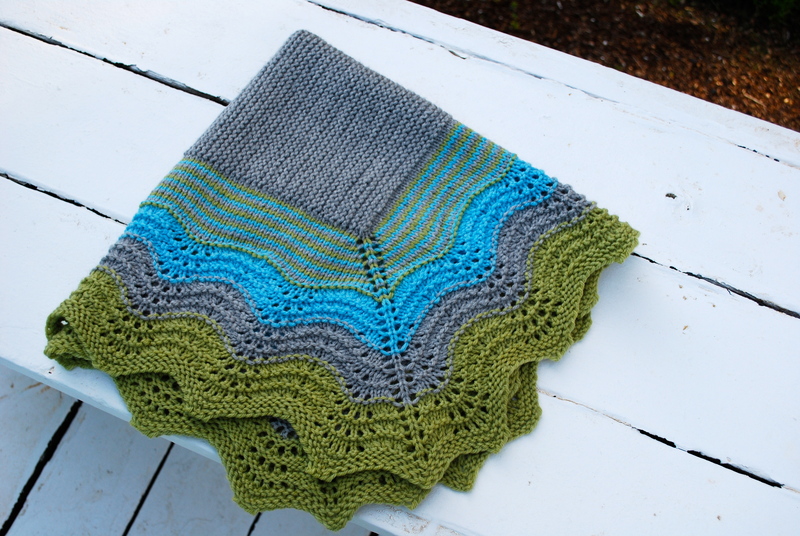 ), and the pattern suggested that the shawl would work well as an heirloom baby blanket. So, I ran out to the local yarn shop and picked up a couple of balls of Classic Elite Silky Alpaca Lace, a lovely mix of alpaca and silk, and started knitting another Quill! 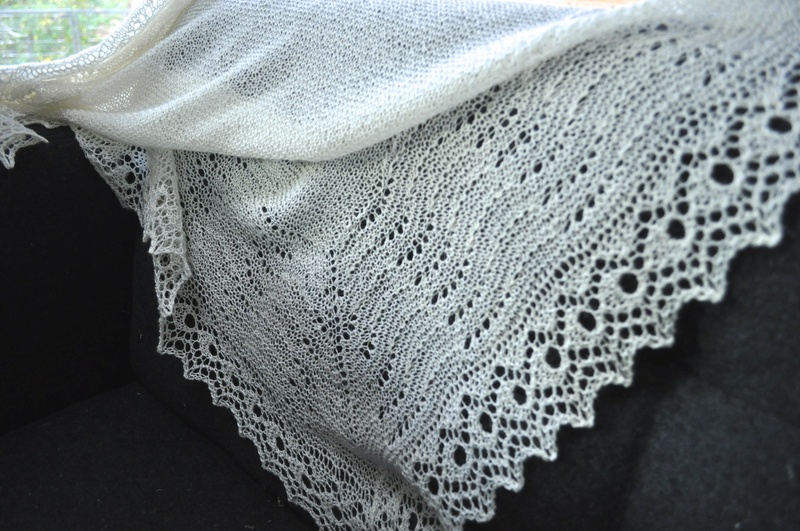 This is a beautiful pattern with the traditional structure of a Shetland Hap Shawl. 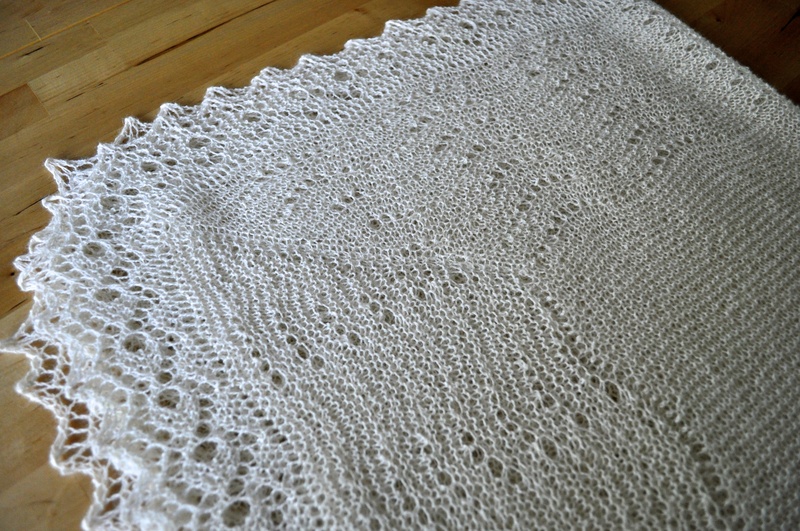 I knit the smaller size, which ended up blocking out to about a 40 inch square. I love the Old Shale Lace pattern, which I happen to think looks like rows and rows of little tiaras (like the one Kate Middleton wore? 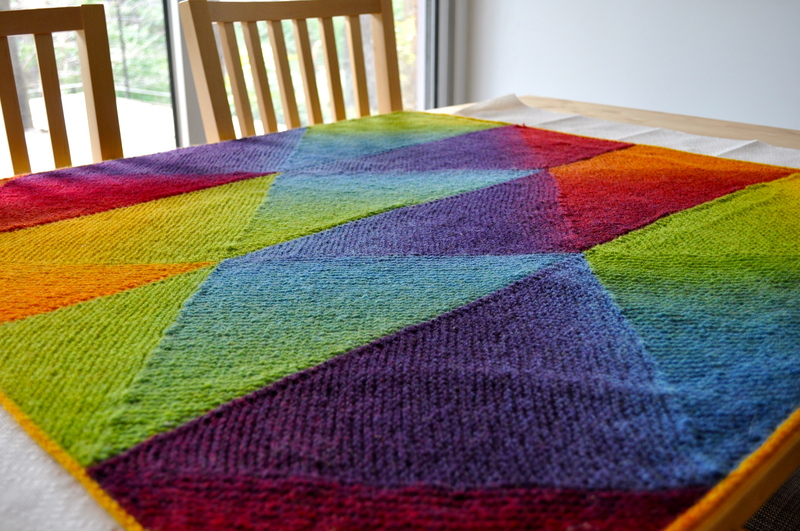 ), and the edging is just gorgeous – takes a while – but is just gorgeous! Here she is blocking. 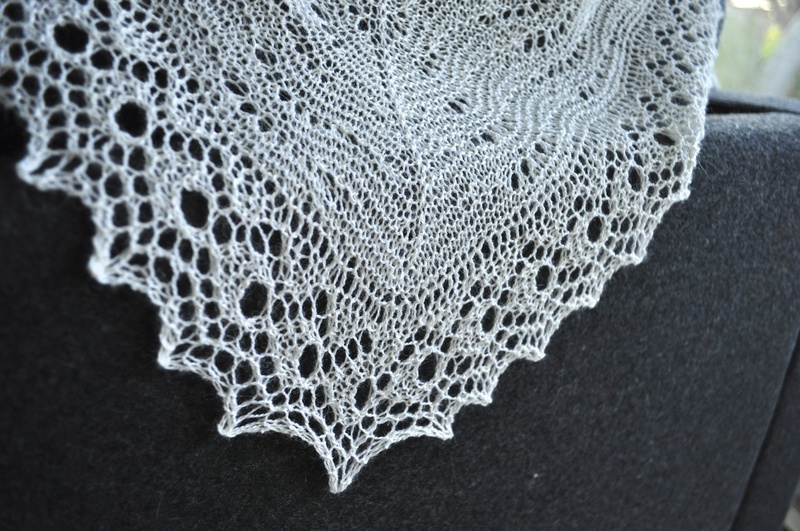 The Silky Alpaca Lace worked really nicely with this pattern. I bought two balls initially, but had to run back to the store to get a third ball (the day I had to finish it for it to make it to the shower!) because I just didn’t have quite enough yarn to finish the edging! I weighed the third ball before and after, and determined that I used about 35 yards (out of 440 yds in the ball). Anyone need a mostly unused ball of Silky Alpaca Lace? 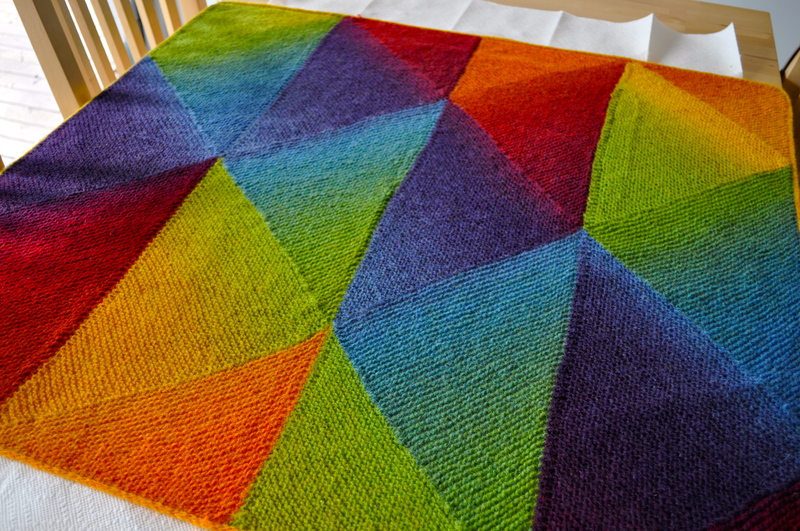 :) It was all worth it in the end, though, because I think this blanket is beautiful. The fabric is light and delicate, but very warm thanks to the alpaca. We’re all excited for your arrival in the world, Baby O, and I’m so happy to contribute something to keep you warm and snug.